Students with artwork from the "Art to Live With" collection. At the University of Chicago, dorm life can suggest a number of things—eating at a house table, participating in IM sports, going all-out (or not) for Scav, and, for some, hanging a world-class piece of art in their dorm room. Art to Live With, the Smart Museum of Art’s free art rental program, gives students in housing the opportunity to make the gallery art a part of their everyday lives. At Art Match on the Sunday of first week, 150 students who arrive at the Smart early enough will have the chance to borrow a piece from the Art to Live With collection to hang in their room for a year. 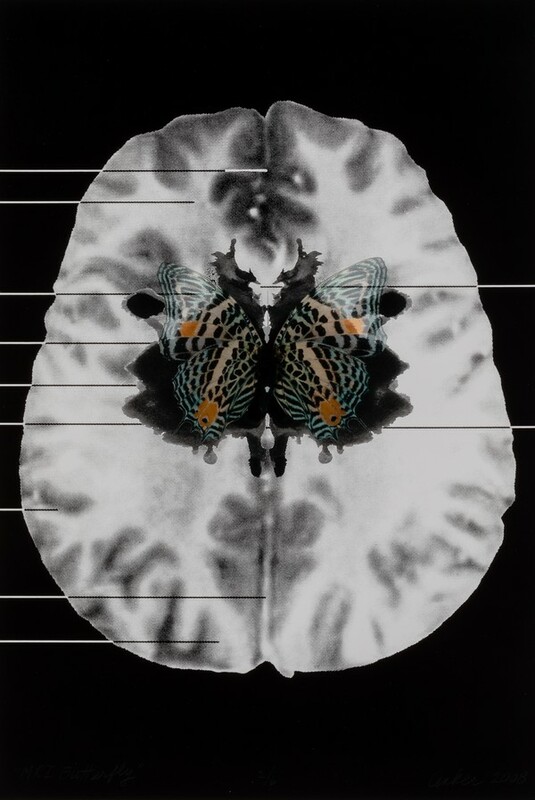 Suzanne Anker, MRI Butterfly (5) (2008). Inkjet print on watercolor paper, edition of 6. Art to Live With first launched in 1958 as the brainchild of Professor Emeritus of Art Harold Haydon (Ph.B.’30, A.M.’31) and University trustee Joseph Randall Shapiro (X ’34). Shapiro, who believed that “the best way to become acquainted with art—and to appreciate it—is to live with it,” filled the first collection with modern European paintings and work by Chicago artists. Students paid 50 cents to a dollar to rent artwork for one quarter. Although the program was put on hold in the 1980s, it relaunched last year to the great enthusiasm of students from all corners of campus. Featuring artwork by Pablo Picasso, Ester Hernandez, Max Ernst, Orkideh Torabi, and more, the collection contains both international and local artists, a combination of well-known and emerging work. Doubling last year’s impressive 75-piece collection, this year’s collection features new additions such as a drawing donated by DoVa Professor Pope.L., a commissioned piece by Kevin Pang (winner of the inaugural Art to Live With Department of Visual Arts (DoVA) MFA Acquisition Award), and nine new acquisitions proposed by the 10 students of the Art to Live With Collections and Acquisitions Committee. 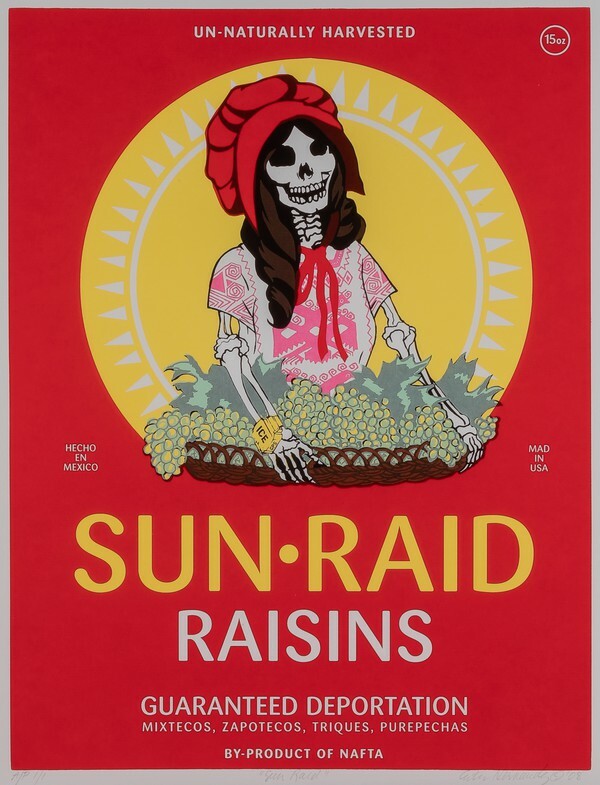 Ester Hernández, Sun Raid (2012). Museum quality Giclée print, artist’s proof 1/1. Among the new acquisitions is “Flowerball 3D Sequoia Sempervirens” (2013) by Takashi Murakami, whose work was recently featured at the Museum of Contemporary Art Chicago. Proposed by second-year Christine Gu, a member of the Collections and Acquisitions Committee, the lithograph reflects her goal to showcase more Asia-based artists in the Art to Live With collection. Another standout addition is Gordon Parks’s “Untitled, Washington, D.C.1963,” a limited edition print from his Civil Rights series. The photograph captures the crowd at Martin Luther King Jr.'s "I Have a Dream" speech during the 1963 civil rights march. “I was particularly excited about this photograph for its potential to start conversations,” said Anna Carroll (A.B. ‘19), who believes that the Art to Live With program has the power to attract students who might not have previous interest in the arts. “I love this image because it comments on the relationship between art and politics, and conveys the important role that art can have in enacting social change,” said Carroll. 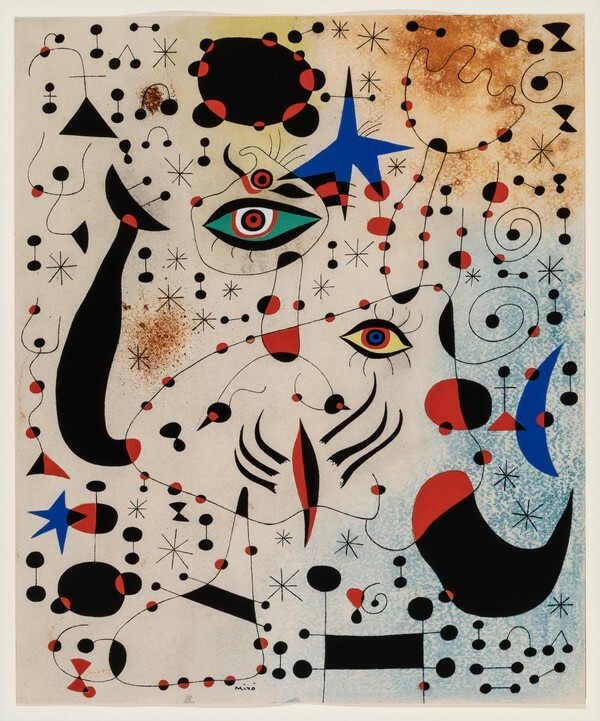 Joan Miró, "Ciphers and Constellations in Love with a Woman" (1941). From the series "Constellations." Indeed, the 150 pieces in the Art to Live With Collection will challenge you to think critically, rethink your convictions, and appreciate learning from a primary source up-close. All that stands between eager students in housing and their most-memorable dorm décor is some research (browse the full collection here) and the commitment to make it to the Smart’s gates by 8 a.m. on October 7. Third-year Andrew Langford, who befriended Adams on the spot and borrowed Joan Miró’s “La Poétesse” (there are four additional Miró prints in this year’s collection), echoes his sentiment. “The long wait may sound daunting, but as long as you bring the right stuff…and have some friends (or make some friends there), it can actually be a pretty memorable outing,” he said. Much like dorm life, the Art to Live With Collection thus has something for everyone. Attend Art Match to hang a piece of history and humanity right by your window—a testament to living next to the Smart Museum, and to living in a city with a thriving art scene. Preview the collection during the ART-B-Q on October 4, 2018, 5–8 p.m.